Kelp - A type of seaweed that grows in oceans around the world and is one of the richest sources of natural iodine, which is essential to your thyroid gland. The thyroid uses iodine to crate hormones that regulate your metabolism. When you’re not getting enough of these hormones, you’re likely to feel sluggish and gain weight. 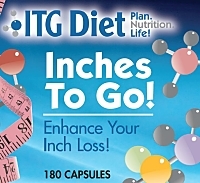 Inches To Go provides your thyroid with what it needs to keep your cells vital and thriving. Bromelain - Is a mixture of what food scientists call proteolytic enzymes, which break down tissues in your body. Derived from the pineapple plant, bromelain has a number of positive effects, the most important of which is that stored fat breaks down more quickly. *Note this product will only work with a weight loss plan. Not to be used and expect to lose inches without a plan.